My grandchild had his haircut yesterday. There aren't many barber shops which offer young children's haircuts to young children in this town. We went to a barber shop which I finally found two months ago. So tThis was his 2nd time for his secondhaircut. At Thefirst time was extremenly difficult, hHe refused to take a文 wear a barber's cape, so I held him without any covers during his haircut. After the haircut , as I had feared , our bodies we were covered in his withhair. This time, we prepared waterproof coat, however it was too hot and he also refused take it. Then the result was same, we were full of sweat drenched with sweat and covered in his with hair. 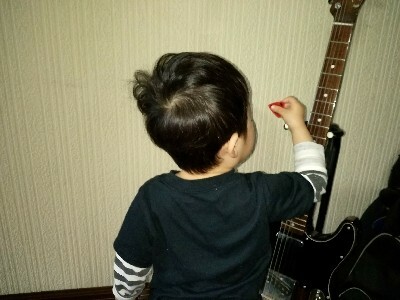 My grandson plays my guitar after his haircut.